WATERFALL » Each phase of product life cycle takes place in sequence. » All requirements gathering and design work is done before code. Cons of Waterfall » Building software for a client who doesn’t really know what they need and what is possible. » Designers aren’t able to foresee problems from the implementation of their designs. » Changes to requirements are not easily incorporated. AGILE » Incremental, iterative approach. » Instead of extensive planning upfront, agile allows for changing requirements over time by using cross-functional teams. Cons of Agile » Documentation can sometimes be neglected. » Can be a problem in large organizations if not implemented correctly. Lean UX Smashing Magazine: Lean UX » Inspired by Lean and Agile theories. » Less focus on design deliverables, more focus on design. » Minimum amount of information required to start implementation. Lean UX Manifesto » Early customer validation over releasing products with unknown-end-user value. » Collaborative design over designing on an island. » Solving user problems over designing the next “cool” feature » Measuring Key Performance Indicators (KPIs) over undefined success metrics. » Applying appropriate tools over following a rigid plan. » Nimble design over heavy wireframes, comp, or specs. ORGANIZATIONAL SILOS » Multi-disciplinary teams are at the heart of user-centered design however many enterprise organizations have internal teams working in silos. » Product management, developers, business analysts, project management, marketing, etc., all working on their own island. » Collaboration can face resistance. ESTABLISHED PROCESS » Internal processes and organizational structures have been established long before UX was introduced. » Those established techniques often don’t blend with common UX workflow. » Change can be scary. Some managers are afraid to replace old models for new strategies. » Managers want to see the final product, not an MVP. FEATURES FIRST, UX SECOND » Stakeholders want to add features for every perceived problem. » Feature creep - confusing internal requirements for persona goals. » Stakeholders interpreting persona motivations and goals instead of UX, through research. USER RESEARCH » It can be challenging to find specialized end users to participate in research. » Some stakeholders don’t see the value of user research and think their insights are more relevant than those of the users. DESIGN » Designers are asked to design “micro-experiences” and not given the information to consider the entire experience. TOO MANY TOOLS . » Each team has its own preferred set of tools which can make collaboration and hand-offs with other teams difficult. ENGAGING STAKEHOLDERS » Conduct sessions for UX to explain to stakeholders ⋄ what UX is ⋄ what it not ⋄ the process and activities involve » UX should conduct group or one-on-one interviews to clear up any confusion about the process. CREATE USE CASES » Storytelling - create a narrative-based use case to help stakeholders understanding the user’s journey. REMOTE USER VISITS » Conduct remote user visits and interviews, watch them work. FORM ALLIANCES » The larger the company, the more politics involved. » UX should include product managers and developers in the process. » Use other departments to help recruit user research participants (sales, HR/recruiting, product management). WORK AHEAD » UX should work with product management to define requirements ahead of development in order to rapidly prototype solutions. » This allows for time to get required stakeholder approvals, and make any necessary changes, before handing off to development. PRIORITIZE THE PAIN » With complex enterprise applications, it is impossible to solve all of the design problems at once. » Conducting qualitative (behavior) research to determine the worst pain points. » Use quantitative data to see which site areas have the most traffic. » Develop a plan to decide which issues are most pressing. CREATE SCALABLE DESIGN SYSTEMS » Tackling complex apps screen by screen can be far too cumbersome. » Creating style guides, component libraries, and guidelines will allow developers to find some design solutions on their own. COLLABORATION » Conduct open design sessions which includes everyone (sales, customer services, etc) where anyone can discuss problems and potential solutions. » Designers share their work in-progress with a couple of product managers and developers to get a fresh pair of eyes. 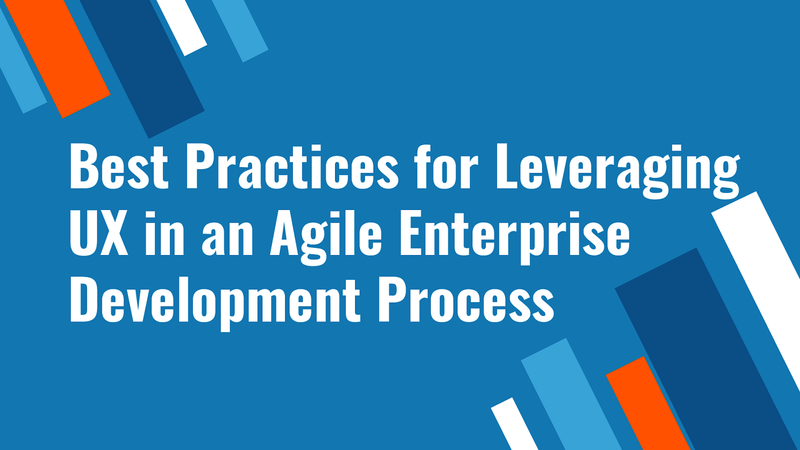 View Best Practices for Leveraging UX in an Agile Enterprise Development Process on Notist. Enterprise organizations are adopting an agile development process but the transition isn’t easy. This talk will discuss the challenges facing the UX process and strategies to overcome them. To be fully agile, the entire team must collaborate and participate in the ideation process. Which groups should be involved? What is each role’s contributions and responsibilities in the collaborative process? What rituals can you adopt to ensure the roles work together to create the best user experiences?